We start with Leah and Kailyn on the intro to the reunion since Chelsea and Jenelle were out for most of the first day of filming. Dr. Drew ask a few questions then awkwardly makes a PSA about preventing teen pregnancy, because, you know, you don’t want to end up on a TV show with him 8 years from now, do you kids? Kail is first in the hot seat and admits this was probably her heaviest season yet. Her divorce to Javi Marroquin will be done in two days and she reveals that she didn’t want to be with Javi prior to him being deployed. She also didn’t realize that Javi thought they would get back together once he came home from being deployed, which she believes was the cause for so much of his hurt and anger in the aftermath of their breakup. Javi gets a chance to tell his side of the story and says that being deployed in Qatar was easier than being home. Can you blame the guy? They rehash why Javi broke into their house and whether or not Kail really asked him to meet at Chipotle, which is a burning question we will never get an answer to. Kail knows she wasn’t being fair and Dr. Drew tries to diagnose Javi as being a control freak for still having feelings for Kail. I wish Dr. Drew would use his medical license and inject himself with some Pipe Down Serum. He really talks too much for my liking. Now that we have sorted through that mess, Javi leaves and Jo joins Kail on stage. Jo mumbles through how he helped Isaac with understanding the divorce and his own feelings on the Javi and Kail’s divorce, which he didn’t see as a surprise. Why not? Because he never saw any deep love there. Damn, that’s cold and an equally cold Kail doesn’t even react to that claim. 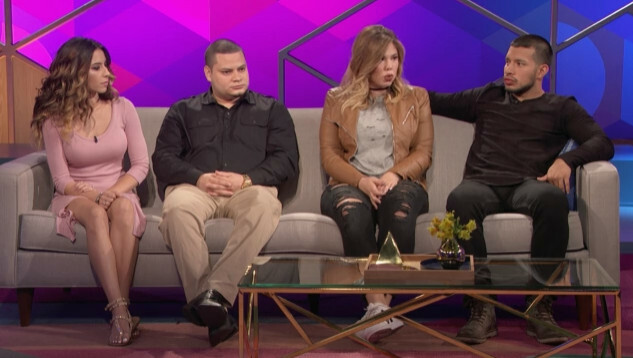 Javi comes back on stage and Kail sits in between them, making for the worst sandwich ever. Dr. Drew interjects way too much again and I get annoyed and yell at my TV (anyone else do the same?). Vee comes out, looking way too good to be engaged to Jo, let alone have a kid with him and she gives her take on the whole divorce: sad. Kail immediately bristles and gets defensive over Vee’s very non-threatening take on why Jo might want to ask for 50/50 custody. Vee cites how they moved their whole life to Delaware to be closer to Isaac and Kail wants to know what that has to do with her. Typical Kail – if it doesn’t benefit her, no one else has a say. Dr. Drew interjects and says to be fair, asking for 50/50 should be coming from Jo, right? He waits and waits for Jo to respond to the prompt but gets nowhere because Jo is clearly too scared to give his real opinion while sitting next to Kail. Dr. Drew continues to translate between Kail, Javi, Jo and Vee instead of just letting them speak for themselves. Snooze. 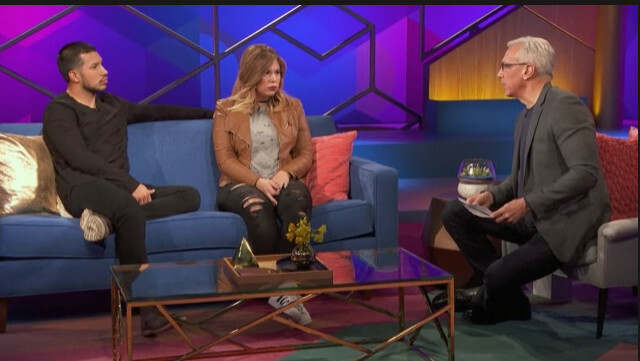 Finally, Kail officially shuts down and Dr. Drew tries to lighten the mood by asking if the four of them all hang out. That would be a big no. Chelsea comes to the couch to discuss her season, which despite the excitement of getting married and conceiving again, was marred by her ex Adam Lind being the douche that he is. Chelsea tells us that the situation with him has gotten worse and he never sees Aubree. Poor Chelsea’s life is so normal and happy, all Dr. Drew has to keep talking about is Adam, who was supposed to attend the reunion but decided in a last minute rage that he wasn’t coming and sent the following text to a producer: “EFF YOU ALL”. That’s just a summary, but you get the gist. Chelsea attributes this behavior to him being a narcissistic sociopath but really, who cares at this point? Because we have a montage of Adam calling out the show! It’s really just a highlight reel of bad haircuts and even worse jeans. The audience actually claps when it’s done, just like I’m doing now that part one of the reunion is over! TELL US – ARE YOU SURPRISED THAT ADAM DIDN’T SHOW UP? WHY IS KAIL SO OFFENDED OVER THE THOUGHT OF 50-50 CUSTODY WITH JO BUT NOT WITH JAVI? SHOULD VEE HAVE SOME SAY SINCE IT AFFECTS HER LIFE, TOO?